You can easily add or upload files to OneDrive online at any time, from mobile devices as well as your laptop. Just follow these simple steps. Click the Microsoft Edge button on the taskbar. Right-click to display the Address field, type https://onedrive.live.com, and press Enter. If MSN.com is your browser home page, you may see a button that you can click to go to OneDrive. Follow the process for signing in, if prompted, and use your Microsoft account user name and password. Your default folders appear. Click a folder to open it. 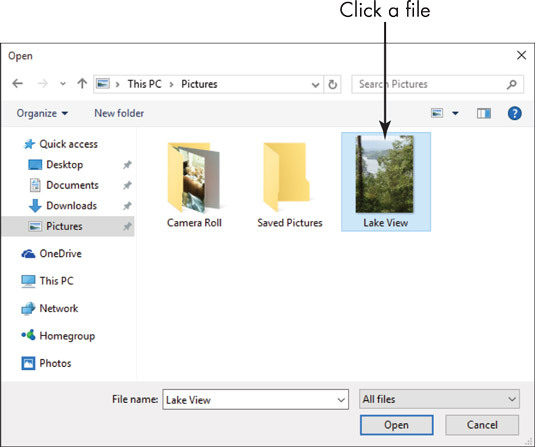 After you click a folder, click OneDrive in the toolbar to redisplay your default folders. Click the Upload button in the OneDrive toolbar. Use the Open dialog box that appears to locate a file or folder. Click a file or folder. You also can add a file to OneDrive by dragging it from the File Explorer window to an open OneDrive folder in your browser. You may want to delete a file from OneDrive, as the free storage is typically limited to 15 gigabytes (GB). First, find the file that you want to delete in OneDrive. Right-click the file, and then click Delete.